The Organization for Security and Cooperation in Europe (OSCE) has its origins in the early 1950s, when the Soviet Union first proposed the creation of an all-European security conference. In the mid-1960s the Warsaw Pact renewed calls for such a conference. In May 1969, the Government of Finland sent a memorandum to all European countries, the United States and Canada, offering Helsinki as a conference venue. Beginning in November 1972, representatives from the original 35 nations met for nearly three years to work out the arrangements and the framework for the conference, concluding their work in July 1975. Henry ‘Scoop’ Jackson pushed the National Environmental Policy Act (NEPA) through Congress in 1969. President Richard Nixon signed it in 1970. The legislation established the Council on Environmental Quality (CEQ) as an executive branch advisory council. 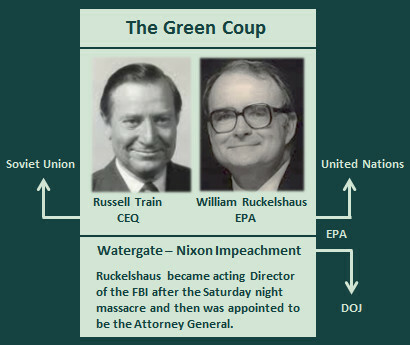 The Environmental Protection Agency was created by Nixon’s government Re-organization plan No. 3. Under Secretary of the Interior, Russell Train became the first Chairman of the Council on Environmental Quality. William Ruckelshaus was appointed to be the first EPA Administrator. Richard Nixon signed the U.S.-USSR Environmental Cooperation Treaty on May 23, 1972. Russell Train, Chairman of the CEQ was designated as the principal coordinator working directly with the Soviets in cooperation on environmental issues. The United Nations Conference on the Human Environment was scheduled in Stockholm, Sweden in 5-16 June 1972. Maurice Strong was the Secretary-General for the conference. It was decided at the conference to establish the United Nation Environmental Programme (UNEP). The Organization for Security and Cooperation in Europe (OSCE) was institutionalized and is in operation to this day. The U.S. Commission on Security and Cooperation in Europe (aka Helsinki Commission) is an independent agency comprised of members of Congress.